Here at the office we're super excited to see community made tournaments. The 6th King Puff Cup has just been announced and this ongoing initiative fills us with extreme energy, enabling us to do 10 squats every morning at scrum! Minion Masters for Xbox One - for fun! We have partnered with Microsoft after one of their game scouts got to Platinum league in a weekend and afterwards eagerly reached out to us. 2 vs 2 Team Battle for Minion Masters, oh yeah! The posts convinced us and now we're really psyched to finally see how it works in the team battle event, and we will then use whatever we learn from this event to iterate on it, and ultimately release it as an awesome new permanent mode in the game. From left, Kristian (Programmer), Peter (Designer), Steffen (CEO). Trying out lunch in the sun - which makes us sympathize with Vampires! - Alex (Animator) has tried out crossfit after years of regular weight lifting and is by far the strongest dwarf on the team now (6'4" 200 lbs). - Steffen (CEO) has started playing a ton of co-op board games with his girlfriend. (The secret plan is that this is a build up to make her skilled at strategy games and ultimately enable her to play MM). - Martin (Lead 3D) has ordered desk fans for everyone, to cope with the stifling heat in the Dwarf Fortress. Note that he uses 6 screens, so maybe that's why he was sitting in a pool of sweat and consequently took the initiative to get some proper air circulation going. Modern technology is great!. 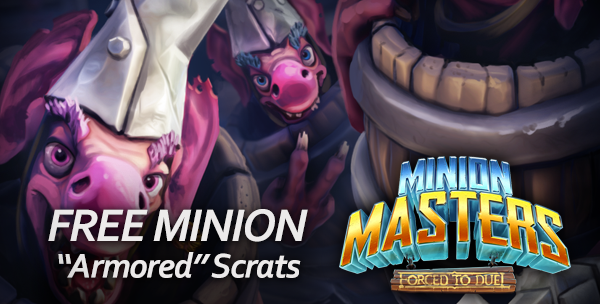 A gift for you - Armored Scrats for Minion Masters! We've made a code for you as our dear ready, to be used in Minion Masters for a limited time period, as a reward for reading our blog. To use the code, enter it in the in-game shop. Look for the “redeem code” button in the top right. The code is valid until July 19th, 2017. 2 VS 2 TEAM BATTLE EVENT! 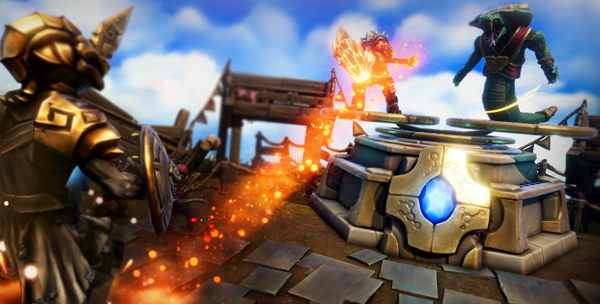 It’s time to try Team Battle in Minion Masters! You can now play with friends or with strangers. You have two new individual league rankings for team battles, and both can give rank rewards! Have you tried all the games in the FORCED universe?